As far as I can recall, yesterday was the first time I see Saudi Arabia’s Foreign Minister Prince Saud al-Faisal so spirited in public. He was speaking at a joint news conference with U.S. Secretary of State John Kerry after their talks on Syria in Jeddah. The pair’s body language was also telling. Showing no sign of his debilitating back pain, Prince Saud was blunt and passionate about the state of play in Syria. His words read like sheer exasperation. Kerry on the other hand sounded listless and downcast. Saudi Arabia cannot be silent at Hezbollah crossing from Lebanon to back regime forces in Syria. Syria is facing a double-edged attack by Hezbollah and Iranian Revolutionary Guards with unlimited military support from Russia. Along with the regime's genocide against its own people, this adds an even deadlier element in the form of an all-out foreign invasion. Syria now can only be considered an occupied land. This requires resolute and swift action by the international community. There no longer is rhyme or reason to let pass Russia’s blatant and incessant arms supplies to the Syrian regime… Meantime, we are still failing to secure international protection for the Syrian people, or at least provide some sort of military assistance to help them defend themselves against abhorrent crimes being committed against them with nary an excuse. The kingdom demands a clear, unequivocal international resolution that bans any sort of weapons’ support for the Syrian regime and declares null and void the regime’s legitimacy. The illegitimate regime cannot possibly be part of any arrangement or play any role whatsoever in shaping the present and future of Syria. This is a situation that’s been made far more difficult and complicated by Assad’s invitation to Iran and to Hezbollah, Iran’s surrogate, to cross lines – international lines – and to become engaged on the ground in Syria. It is the Assad regime that has internationalized the violence on the ground in the worst of ways. We believe the best solution is a political solution in which the people of Syria have an opportunity to be able to make a choice about their future. And we believe that every minority can be respected, that there could be diversity and pluralism, and that people could do so in a climate of peace in the absence of oppression and violence or the involvement of foreign fighters, providing the Assad regime is prepared to live by the framework that was created in the Geneva communiqué for a transition government with full executive powers chosen by mutual consent of all the parties, which really has the best chance of bringing about peace in Syria. We continue to believe Geneva-2 offers the best opportunity to be able to try to bring that about. As Prince Saud and Kerry were speaking in Jeddah, Syria troubleshooter Lakhdar Brahimi was telling reporters in Geneva ahead of talks with American and Russian officials that Geneva-2 was unlikely to take place in July as he had hoped. "I very, very much hope governments in the region and the Big Powers -- in particular the United States and Russia -- will act to contain this situation that is getting out of hand, not only in Syria but also in the region." Brahimi voiced deep concern at the deadliest outbreak of violence in Lebanon since the start of the Syrian conflict in 2011. “Events in the city of Sidon in Lebanon yesterday, where over 50 people were killed, are a stern reminder to all of the risks of the conflict in Syria spreading across borders to neighboring countries,” he said. Foreign fighters – whether from Iran’s Revolutionary Guard or Quds Force, or Hezbollah, or Iraqi Shiite militias, or regrettably other regional Shiites – swarmed into Syria at Bashar Assad’s invitation to save his regime. Even the security of Damascus is in the hands of Qassem Soleimani who hardly leaves the capital city. Hezbollah rules Syria’s borders with Lebanon. The Baghdad government controls Syria’s border with Iraq and directs its forces and the Iraqi Shiite militiamen to back Assad and stifle the Free Syrian Army (FSA). Israel occupies the Golan and allows Assad’s army to deploy tanks on the Heights to shut out FSA fighters from the Quneitra crossing. Russian warships are off Syria’s Mediterranean waters. All this shows Syria is splintered and occupied after Assad killed about 100,000 of his own people. Prince Saud al-Faisal’s remarks mean Saudi Arabia does not accept a political solution in Syria that keeps Assad in office. This is the kingdom’s underlying position vis-à-vis current or future political initiatives that aim to save Assad, including the unlikely Geneva-2. 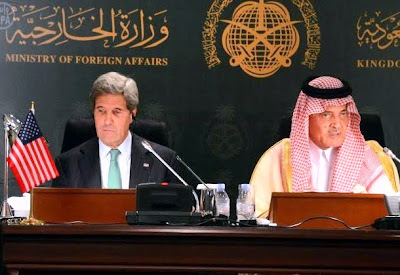 Prince Saud al-Faisal’s remarks were pivotal and conclusive. He called things by their name and gave the Syrian opposition a shot in the arm. His remarks mean Riyadh is proceeding with propping up the FSA so it can defend peoples’ lives and land. Labels: Assad, FSA, Geneva-2, Hezbollah, Iran, Iraq, John Kerry, Lakhdar Brahimi, Lebanon, Prince Saud al-Faisal, Russia, Saudi Arabia, Syria, Syrian opposition, U.S.